for the Solar Eclipse in Cairns November 14th 2012. 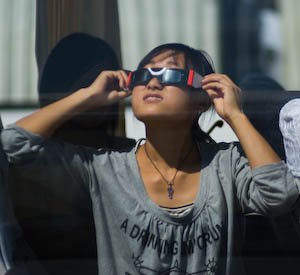 Note : This is an article about how to view the November 2012 Total Solar eclipse in Australia. If you want information about the next annular solar eclipse visible across Australia on May 10th, 2013 click here. This page has been written as an introduction to solar eclipses and a description of what you can expect to see from the Cairns region on November 14th. It is aimed at first time eclipse chasers. A more detailed description of the lay of the land and a lot more information about the eclipse is available for experienced eclipse chasers. Novices are advised to read this introductary document first. What will the partial eclipse look like from your town or city? A total eclipse will be visible from Cairns beginning just after sunrise on 14th November 2012. Why not combine the experience of this great spectacle of nature with a visit to a hotspot for some of Australia's iconic attractions? 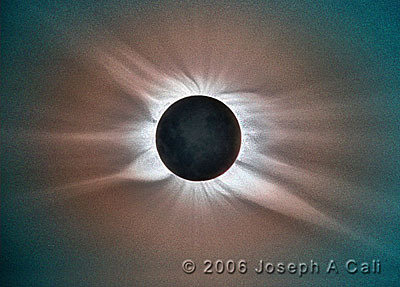 A total solar eclipse occurs when the Moon passes between the Sun and the Earth. Total solar eclipses can only occur at some New Moon's but they don't occur every New Moon because the Moon's orbit is inclined 6o to the Earth's obital plane. Eclipses only occur when the Moon passes through the Earth's orbital plane at New Moon otherwise the shadow misses the Earth(as illustrated in the diagram below). Many people think they've seen a total solar eclipse when in fact they've seen a partial eclipse. Partial solar eclipses can be seen from a very wide geographic area. Most adults in Australia will have been able to see a partial solar eclipse at some point during their lives. Deep partial eclipses, deep enough to cause noticeable darkening of the sky. However, total solar eclipses must be viewed from within a relatively narrow path defined by the Moon's travelling shadow. This path usually covers about 1% of the Earth's surface with 2/3rd's of this being over oceans. Total eclipses occur on average about once every 18 months. Because most of the Earth's surface is either ocean or remote desert or wilderness, you usually have to go to a lot of trouble to see one. From any one fixed location, a total solar eclipse can be seen about once every four hundred years. Over the past eighty years only three total eclipses have been visible from the Australian continent. A total eclipse in 1974, could only be seen from southwest W.A. near Albany. The most widely seen event was in October 1976 when the Coorong, Mt Gambier, most of southern Victoria and the southest corner of NSW saw a total eclipse. The bigger towns included Mt Gambier, Bendigo, Ballarat, Geelong, Melbourne and Bombala among many others. 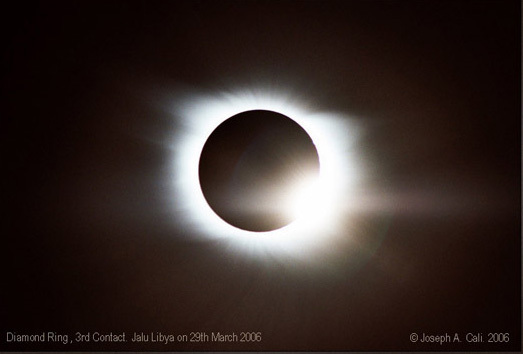 In December 2002, a total eclipse was visible inside a narrow 20km wide path over very remote areas of South Australia between Ceduna and Cameron Corner. After the 2012 Cairns eclipse, the next opportunity to see a total eclipse in Australia is from remote Exmouth, W.A. in 2023. In July 2028, a total eclipse will cross the whole continent starting in the Kimberley crossing many regional towns and centres and finally being visible across much of Sydney. There is some confusion over the date of the eclipse because some documents list the eclipse occurring on November 13th, 2012 while others will say November 14th, 2012. Both are quite possibly correct. It is standard practice to document astronomical events in 24 hour universal time. Universal time is the time (and date) at Greenwich Observatory in England. This allows astronomical observers anywhere in the world to read a document and easily work out the time of the event at their own location without confusion. You will see the letters UT or UTC printed with the time when this is the case. In universal time, the total eclipse begins at 20:38UT on November 13th, 2012. Any resource that is written for astronomers will use this standard. You need to add 10 hrs to convert UT to Australian Eastern Standard Time (EST) which is the local time zone in Cairns. 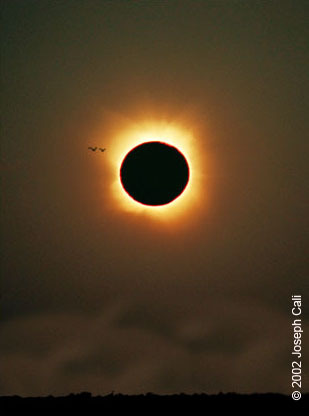 Expressed in Australian EST or local time, the total eclipse begins in Cairns at 6:38 am on November 14th, 2012. The first point of contact of the Moon's shadow with the Earth's surface occurs north east of the Kakadu National Park, in a line extending northeast of Ubirr Rock. The shadow travels east across Arnhem Land, crosses into the Gulf of Carpentaria coast at the north end of Blue Mud Bay. It strikes land again on Cape York Peninsula near Wallaby Island. The centreline crosses the Eastern coast 30km north of Cairns about halfway between Cairns and Port Douglas. After that it crosses Green Island before heading south east across the Pacific where it doesn't touch land again. The 2012 total eclipse can be seen along the coast from a 140 km wide path. The path crosses the coast at an angle so that the 140km wide path covers a 200km swathe of coastline between Innisfail in the south to Cedar Bay National Park about half way between Cape Tribulation and Cooktown. Outside this area, a partial eclipse only will be visible. Just outside the total path, for example south Innisfail, a 99.9% partial eclipse is visible. Be in no doubt, a 99.9% partial eclipse is not almost the same as the spectacle of a total eclipse. If you live near the edge of the path, get in the car and drive into the path of totality. Anywhere between Gordonvale and Port Douglas on or near the coast are the best places to see the eclipse. The duration is longest in this area. 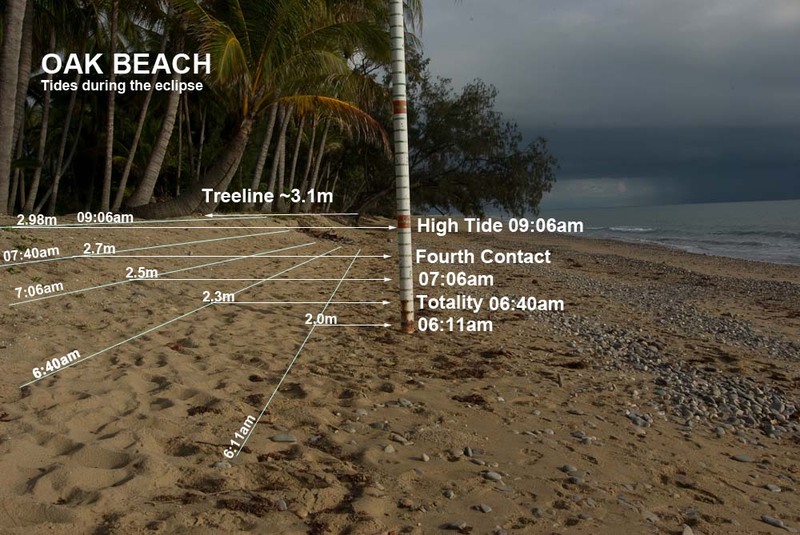 The total part of the eclipse lasts for two spectacular minutes anywhere between Cairns and Port Douglas. To the north and south, duration gets progressively shorter and shorter until, near the southern and northern limits, it only lasts for a few seconds. For folks living in or near Innisfail, watch from at least 20km north of Innisfail say Babinda or Bramston Beach to get a decent duration of about 1m 20s. This map is a low-resolution illustration and only intended to show the relative positions of places mentioned in the text. High resolution maps and predictions of all eclipse paths are available from the web site links provided at the end of this document. Any place with a good view of the east horizon will make a great place to watch the eclipse. Though the beach immediately comes to mind, the tide will probably be coming in as the eclipse progresses. Some beaches may become covered by tides . New Moon occurs at 06:38. A high tide of about 3m occurs mid-morning (9:06am) on the day of the eclipse in this region. Tide height during totality will probably be about 2.3m. So the tide will be low at 3am about the time you select your observing location. High tide will be coming in during the eclipse and high tide will occur about an hour after the total eclipse ends. Oak beach might seem to be the perfect spot located on the beach and the centreline but the following photograph shows why Oak Beach should be avoided. In the photo above I tried to take the photo keeping the camera level with the ground in the beach house yard. I was probably a touch low. The back yard is more like 3.1m. In the photo below, I've constructed contours and then using tide data, annotated the photo with times when the tide will reach it. 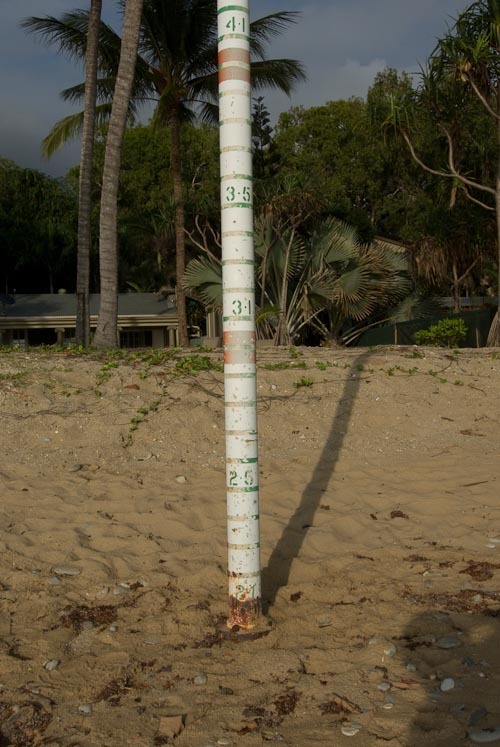 Some beaches north of Cairns do not get completely covered during a 3m high tide. These include Kewarra beach, Trinity beach and Palm Cove. If you are just looking by eye or using a camera and tripod, these beaches are ideal. High ground might also appeal. One very obvious spot is Rex Lookout on the Captain Cook Highway. However, people stopping at the lookout has the potential to cause traffic problems so the authorities have decided to close the lookout during the eclipse. Expert observers who bring telescopes should probably retreat inland a few kilometres to shelter from any onshore winds. The many open fields between Skyrail and the airport should provide adequate cover. These agricultural fields though unfenced, are private property. Please treat any crop plantings with due repect. Use the verges, don't trample the tilled fields and don't drive onto ploughed soil. You might damage the plantings or become deeply bogged. 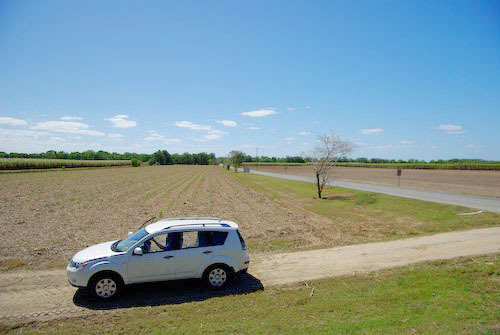 Example of an open field suitable for anyone wanting to get away from the coast. Charter boats will be offering cruises to take people out to watch the eclipse at sunrise from the boat or on diving platforms on ocean reefs followed by reef viewing, diving or snorkelling after. These reef and sky tours present a unique way to experience the eclipse. Be aware that the reef platforms are pontoon platforms that will move with the ocean swell. The boats are too small to be fitted with stabilizers. If you are using any sort of telescope, binoculars or camera and tripod, you should probably stay on solid ground. You don't need to use binoculars or telescopes to enjoy an eclipse. So much is going on around the whole sky many choose to just look with the naked eye. If you just want to look and enjoy, these reef and sky charters might be just the ticket. November isn't the sunniest month of the year but nor is it the cloudiest. It is in the build up but definitely before the start of the monsoon. Humidity causes cloud build up during the days. Afternoon and evening showers and thunderstorms are common. Fortunately mornings are typically fine and sunny along the coast but with some scattered cloud off the coast almost every morning. The rising moist air causes clouds to form along the tops of the coastal mountain range so it's probably wise to stay clear of places like Mt Molloy, Mareeba, Atherton and Kuranda. No cyclone has ever occurred in November in North Queensland in the time since records have been kept. 1. The Australian Bureau of Meteorology http://www.bom.gov.au is a primary source of general weather information. 3. Andrew Cool's Skippy sky Astro weather forecast site has a North Queensland map covering the eclipse. Skippy Sky is a graphical 2d map representation of the GFS (Global Forecasting System) model data. Goto http://www.skippysky.com.au click on Australia and then choose the Cairns tab. The eclipse path is marked on the map. A few minutes after sunrise, the eclipse begins. The Sun first goes through a partial eclipse that lasts for about an hour before the total eclipse begins. During this time, there is great danger of eye damage if you don't protect your eyes. The whole eclipse lasts for about two hours. The total part of the eclipse lasts for about 2mins in the middle of the two hours. During this time, the photosphere, the bright surface of the Sun, is completely covered by the Moon so totality can be safely observed without using eye protection. The total eclipse is only as bright as a full Moon and regardless of what you might read, there are no dangerous rays that will damage your eyes during this period. The two phenomena known as diamond rings mark the start and end of the safe period and it's only during the between the two diamond rings that it is safe to look without eye protection. The Sun goes through an hour of partial eclipse before and an hour after the total eclipse. During both periods, there is great danger of eye damage occurring. How to protect your eyes during the partial eclipses? During the partial eclipses both before and after totality, you must use special techniques to protect your eyes. Looking at the Sun at anytime during an eclipse or even on a normal day can burn the retina causing permanent eye damage. The Sun is no more dangerous during a partial eclipse than it is on any other day. On a normal day, if you glance at the Sun or get the Sun in your eyes for example while you are driving, you don't go blind. But you don't stare at the Sun. During the eclipse, you don't have to protect your eyes from glancing contact with the Sun any more than you do on a normal day. The problem is that during the eclipse, there is a temptation to stare at the eclipse for extended periods especially as the Sun gets covered. Staring can cause burns on the retina leading to permanent blind spots. Using found materials from around the home as defacto solar filters is very dangerous. These materials don't filter the dangerous UV and IR rays and can lead to blind spots even though the image looks dark enough to the eye. Examples of unsuitable filters include pinholes, photographic film negatives, cd's/DVD's, smoked glass and silvered confectionary wrappers among many others. There are no materials found around the home that will safely filter the Sun's high intensity light. Some of these materials might look similar to solar filters but they are definitely not safe. The best policy is to assume that if it hasn't been made for the purpose, it isn't safe. Even during the final minute when the Sun is almost completely covered and the ambient lighting begins to looks like like twilight, the energy in the very thin crescent is more than capable of causing a permanent burn to the retina. There are two accepted safe methods for watching a partial eclipse. One is to look through some sort of specially made filter material, the other is to use some sort of projection method. Eclipse shades are special cardboard frame sunglasses with properly made solar filters built-in. These should be available for purchase at many tourist and retail outlets around Cairns. These are the most convenient filtration method. Do read the instructions. Some of these shades are not rated for continuous viewing but for viewing 30 seconds at a time. A pair of eclipse shades will probably cost less than $10.00. These cardboard glasses use special filter materials that effectively cut all wavelengths of light including the dangerous IR and UV that defacto materials pass to your eyes. Your eyesight is definitely worth the investment. Other suitable filters are a number 14 arc welding filter available from welding suppliers or a special solar filters available from astronomical suppliers designed to be attached to telescopes or binoculars. The oldest safe method is the projection method. Cut the side out of a large cardboard box. Punch a 5mm hole in the side. The Sun will be rising as the eclipse begins. Stand about 3-5m away from the east wall of a white walled building. With your back to the Sun hold the card up so that its shadow falls on the wall. In the middle you will see a small image of the partially eclipsed Sun. The Sun will rise at 5:34am. About ten minutes later the partial eclipse will begin. If you are on the Cairns waterfront, the Sun will remain hidden behind Cape Grafton for 15-20minutes. It will rise over the cape about one third eclipsed. The dark disk of the Moon will ingress upon the Sun's disk from the west which is the top when viewing the rising Sun in the east. The appearance of the first half of the eclipse up to the beginning of totality is illustrated in the gif animation below. The partial eclipse will take 54 minutes. As totality approaches, the solar crescent will become very thin. Though thin, it is still too dangerous to look at without any eye protection. About a minute or two before the start of the total eclipse, look to the west. You will see the Moon's shadow moving across the sky from west to east. West to east may at first seem a little odd. Even though the Moon rises in the east and sets west due to the Earth's rotation, the Moon actually orbits the Earth from west to east. So the shadow being cast by the Moon also travels from west to east. The shadow will move slowly when it is near the western horizon, very quickly as it passes overhead and to the east. When this shadow reaches the Sun in the east the total eclipse begins. 28o 7:40 a.m. Partial eclipse ends. Eclipse ends. covering most of the sky. 7o 6:00 a.m. Partial eclipse about halfway through. During the minute or so before the eclipse the lunar shadow covers the sky. The ambient light will dim dramatically reducing by a factor of about a thousand. If you have a really accurate time source, you can remove your eclipse glasses about ten seconds before the start of the total eclipse. The Moon's shadow by now will have moved right across to cover the whole of the sky. 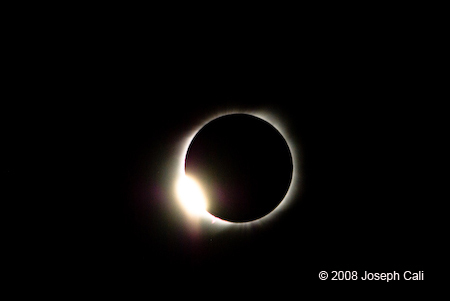 When the front edge of the shadow reaches the Sun, the diamond ring will form and the total eclipse begins. The diamond ring is a bright ring of light surrounding the dark lunar disk with one dazzling bright white point of light. The diamond ring light is the last little bit of the Sun's surface visible through the deepest valley that points at Earth on the the edge of the Moon. Even when this disappears, it won't. go completely dark, more like a very deep twilight. Your eyes will quickly adjust to the new low light level. As your eyes adjust, the Sun's corona will become visible. The corona is composed of very hot electrically charged gas - a plasma. The coronal gas has a temperature of about a million degrees and it stretches millions of kilometres out into space. The charged particles are distributed along and reveal the Sun's magnetic field lines similar to the way your science teacher at school might have used iron filings to reveal the field of a magnet. The corona will appear to grow. This is just an illusion caused by two factors. As the umbra replaces the penumbra in the sky around the Sun, the background sky darkens rapidly allowing the faint corona to be mre visible. The outer corona is fainter than the inner corona. As your eyes quickly adapt to the dark mainly due to dilation of the pupils, they become more sensitive so you are able to see fainter parts of the outer corona so it seems to grow. Nonetheless, the effect is mesmerizing and if you are observing the eclipse in the presence of a large crowd, you usually hear one loud synchonized gasp from the crowd. As totality ends, a diamond ring dazzles you as it seems to explode from the opposite side of the Moon to the first diamond ring. This one seems much brighter than the first because your eyes are adapted to the dark. The appearance of the second diamond ring is your signal to put your eye protection back to work. Put on your eclipse shades or use your projector and don't look directly at the Sun for the remainder of the eclipse. The Moon spends another hour in partial eclipse as it gradually uncovers the Sun. This time the disc will continue its motion to the east and slide off downwards towards the horizon. The event is all over by 7:40 am. The times printed here are average times for the area described. Mountains and valleys around the edge of the Moon can change these times by many seconds. Astronomers call the calculation of this change a lunar limb profile correction or just limb correction. These times do not have limb corrections applied. Your particular location may experience a change. Link to my more detailed description of the eclipse path, observing locations and natural attractions. Michael Zeiller's eclipse maps web site has detailed mapping of eclipse paths. The 2012 maps are not yet available but will be available at : http://www.eclipse-maps.com/Eclipse-Maps/Welcome.html before the eclipse.